The ACCUFAST 6FV is a full 6 feet long and may be used to convey product straight away or to the left or right. 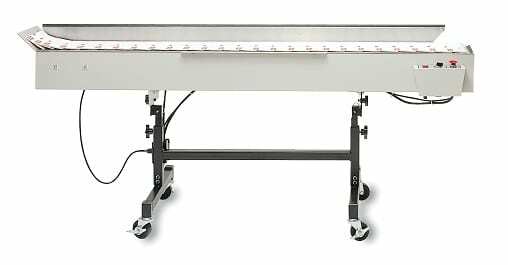 Its transport table tilts and its legs adjust independently to allow for material to run up or down to an operator. The main feature of the 6FV is its extreme flexibility. Change it from a stacking conveyor to a drop down by removing 2 screws! Call 866-430-2874 for More Information or Details! UPDATE! Sorry, they have all been sold! Please give us a call about refurbished 6FV Conveyors. Replacement belts for the Accufast 6FV conveyor are available!